Why People are Getting New Units? If your unit is 10 years or older you should plan on replacing the unit for a few reasons. First is that your current system probably has R-22 refrigerant in it which is being phased out, becoming harder to get, and is becoming very expensive as time goes on. Second, your unit is possibly oversized and not efficient. This is costing you more money then what you would save in the long run after getting a new unit. Another thing to consider is costly repairs due to the fact that your units warranty may have just ran out. A unit not under warranty means that if you have a major breakdown like compressor failure or a leak in the coil then you could be looking at thousands of dollars just to repair. With a new unit you wont have to worry about that because it will be under warranty and everything will be ready to work in top notch condition. How Do I Know If I Have the Right Size Unit? Schedule a free estimate with us and we can possibly perform a heat load calculation to determine how much heat is getting into the home and how much needs to be removed to cool it down. When your home is older and you have done upgrades to it, we can probably find that you can get away with having a more inexpensive and smaller system. If you have two units on your home you might be able to get away with just one unit which saves a lot of money in install cost. An efficient air conditioner is a unit that uses the least amount of electrical energy to produce the most amount of comfort. This is done by reducing start up times and increasing cooling effectiveness. If you want an efficient unit you will want to look at SEER and EER ratings, the higher the rating the better the unit. 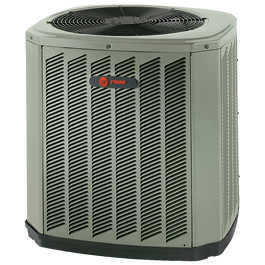 Variable speed units like the Trane XV20i has a 20 SEER rating and can adjust itself anywhere between a scale of 0-100% energy usage at its motors and compressor in order to keep your home cool while using the least amount of energy possible. Two stage units have a low mode for when its not that hot and a high mode for when its really hot. Single stage units just kick on and off so design is really important with these units. Any questions related to efficiency. S.E.E.R. is an acronym for seasonal energy efficiency ratio, it tells you how efficient your air conditioner or heat pump is, and it is measured by dividing the cooling output with the total electric energy input over a range of different temperatures. In the United States, B.T.U.’s or british thermal units are divided by watts per hour. It is related to the coefficient of performance. The higher the rating the better your unit is at using electrical energy and cooling your home. E.E.R. (energy efficiency ratio) is similar to S.E.E.R. because they both are related to “coefficient of performance” but it’s calculated differently with the same indoor and outdoor temperature instead of a range of temperatures and at 50% relative humidity. H.S.P.F. is an acronym for heating seasonal performance factor, it measures the heating efficiency of heat pumps, the higher the number the more efficient. It measures the ratio of heat brought inside to how much electricity used. This style of rating is used because heat pumps are more than 100% efficient since they use electrical energy to pick up heat already outside and bring it inside. A.F.U.E. is an acronym for annual fuel usage efficiency, it measures how efficient your gas furnace is. It measures on a scale of 0% to 100%. If your unit is running at 80% for example then that means it uses 80% of the fuel it intakes and converts it into heat. The closer to 100% the better your unit is at converting gas into heat for your home. Click the button to learn how HVAC works. We cover all the different types of units and components typically found in an HVAC system. Any questions about air conditioning units. 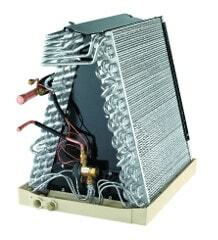 Air conditioners come in different styles and types. For central HVAC there are package and split style units that can be a heat pump or an air conditioner with a gas furnace. Smaller units we work with are mini splits and are best for cooling/heating individual rooms. The tonnage is how big it is and is a measurement of how much heat in B.T.U.’s (british thermal units) an air conditioner or heat pump is capable of removing from a home. Every 12,000 B.T.U.’s is one whole ton. For example, if you have a 3-ton unit then 36,000 B.T.U.’s are capable of being removed. It doesn’t tell you how efficient it is. What are Heat Pumps And How Are They Different From Air Conditioners? Heat pumps and air conditioners both cool the same by removing heat from the home, their main difference is how they heat the home. Heat pumps are able to heat with their same components that cool and air conditioners are typically accompanied by gas furnaces for heat. Heat pumps are able to achieve heating with the same components because of a reversing valve that reverses its flow of freon, so instead of removing heat from the home to cool, it picks up heat from outside and brings it inside. What Are Split Style Units? 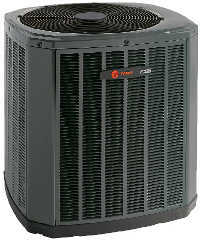 Split style air conditioners and heat pumps have their components separate from each other, they are split apart. Typically, this is the style of unit you see when the air conditioner is outside on the ground, that’s actually just one-half of the system being the condenser coil, condenser fan, and compressor. The other part is the evaporator coil with a fan inside an air handler in the attic. All the ductwork connects to the air handler at plenums. Copper linesets connect flowing Freon for heat transfer from the evaporator to the condenser. There are also smaller units called mini splits for individual rooms. What Are Package Style Units? Typically, package style units are when the air conditioner is on the roof and all the components are in one cabinet. This means the condenser, compressor, evaporator, and fans are all in one cabinet connecting to ductwork in an attic. Any questions related to air conditioning components. All the components that make up the unit itself will be changed like the compressor, condenser coil, fans, evaporator coil and the thermostat although it’s separate. Anything else depends on the scope of the job. When getting a new unit its also wise to consider changing your thermostat especially with new technology giving them the capability to be programmed. The new programmable thermostats allow you to manage your homes comfort without the worry. You create a schedule for what you want and the thermostat does the rest. You will be able to save money by running your air conditioner at different temperatures at different times of the day. For example, in the summer you can program it to run at a higher temperature while you’re gone during the day, so the unit will run less and save money. 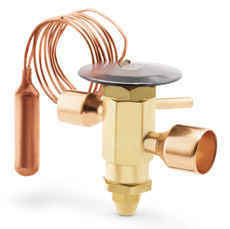 Thermostatic Expansion Valve Pictured Above.